MEMBERS of the local Chinese community yesterday gathered at the Teng Yun Temple in the capital to mark the start of their New Year celebrations. Members of the local Chinese community dressed in their New Year’s best came in droves to pray to their ancestors for a prosperous year ahead. 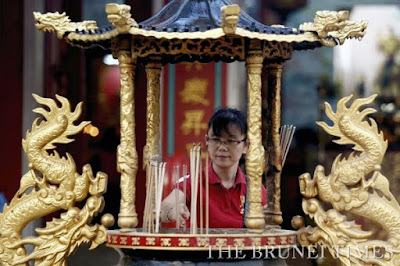 Tiah Eng Nee, Teng Yun Temple secretary, said that this year’s attendance on the first day of Chinese New Year was slightly bigger than last year. “The common perception among the Chinese community is that the Year of the Monkey, which is this year, is quite an auspicious year for work and business so it is quite normal that a lot of people have come to pray for a prosperous year ahead,” he said. Joann Leong, one of the visitors to the temple yesterday, said that besides reason for celebration, the Chinese New Year festivities are also a way for them to uphold their cultural identity and traditional customs. The Chinese New Year celebration is the most important date on the lunar calendar, with festivities lasting up to fifteen days. Tiah said that in preparing for the festivities normally people will start with cleaning their house on the eve of the New Year and avoid doing so on the day itself, believing that it would “sweep away the year’s prosperity” if any cleaning is done during the first day. 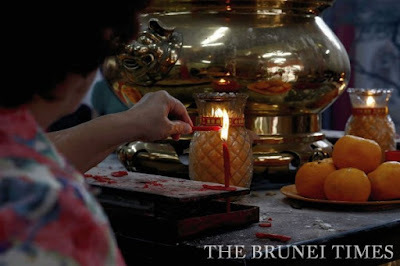 “People would celebrate it by letting off firecrackers, decorating the house with a predominantly red-coloured theme and of course, eating lots of food while visiting friends and relatives at open houses,” he said. Tourists were also seen making their way to the temple to witness a lion dance performed by the Chung Hwa Middle School (CHMS BSB) troupe to welcome the Year of the Monkey. The lion dance troupe performed the traditional Chinese lion dance as well as the dragon dance in front of hundreds of onlookers. 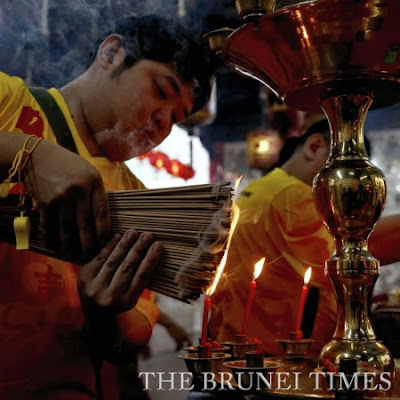 A tourist who saw the performance, Gordon Thomas, told The Brunei Times that he had never seen anything like it back in his home country. “Even though there are more Chinese people back home in England, this is my first time experiencing this Chinese New Year festivities as well as the lion dance performance,” he said. “It is such a fantastic scene and I find the local Chinese here to be worshipful and devout, but also with a bit of fun and excitement in the air which makes for an enjoyable experience,” he said. 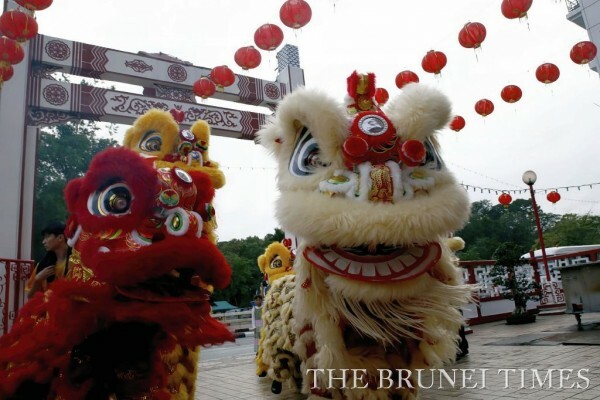 An expatriate who teaches at the Jerudong International School was very appreciative of the local observation of Chinese culture and tradition saying that the lion dance performance was worth waking up early in the morning. “My children loved it and nowhere in UK where I come from is there anything similar to this public spectacle,” said Matthew Clint. “We just love where everyone is immersed in another culture in peace and harmony so it is wonderful to have witnessed the celebration – especially the lion dance performances,” he said. A local resident who witnessed the lion dance performance also appreciated the chance to experience the Chinese culture and traditions.